How fun! I would totally love to have chickens. Of course, we live in a smallish suburban house so that would never fly. But it looks like a fun adventure. Oh Melissa! We live in a small suburban/urban house too! You can watch our adventure and see if it seems doable. Denver allows for up to six “urban chickens” with a permit, so the first step is seeing if your community allows them. Also, we chicken sat for a weekend last year as a trial run. That helped seal the deal for us. Oh my daughter would love to have turkeys! “Mom,” she says, “They make the most beautiful sounds.” Huh?!? Turkeys aren’t allowed on our permit though, so we’ll stick with smaller fowl. Nice new blog template, Mrs. Afthead! I have a chicken question. Do chickens of different “types” get along better or worse than chickens of all the same type. Just curious. I have a friend who has chickens that attack each other and they are all the same type. What animal behavior patterns have you noticed? Thanks! I needed a change. Of course there are a couple of things I don’t like about the new template, but I’m trying to work through those issues. I was nervous about what you would think, oh master of the Internet! 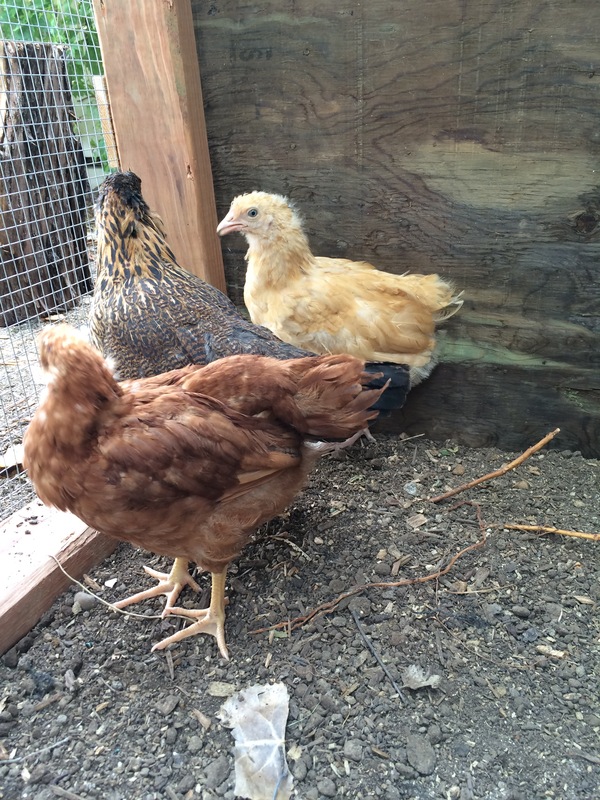 We did pick our chickens based on the docility of their breeds. We have on 5 docility and two 4 docility birds. (5 is “lap-chicken”). That said pecking order is a real thing and Rosie and Hope like playing top chicken. Are your friends birds the same age? Apparently that can lead to problems. So in our few weeks of chicken farming my suggestions fit your friend are limited. Oh dear. I mean, congrats! I really do look forward to hearing more about your new flock. Ha ha! The Aftheads are ridiculously adventurous about the strangest things…. This is great! I love the chicken photos. At the high school where my daughter-in-law works, they have chickens (it’s a charter school with an environmental twist). Keeping the predators away is a big job, but so worth it. Kids and chickens are a weirdly magical combination. My daughter held them and sang to them when they were little chicks. I love that your daughter-in-laws school keeps the critters. What do they do with the eggs? Very cool. 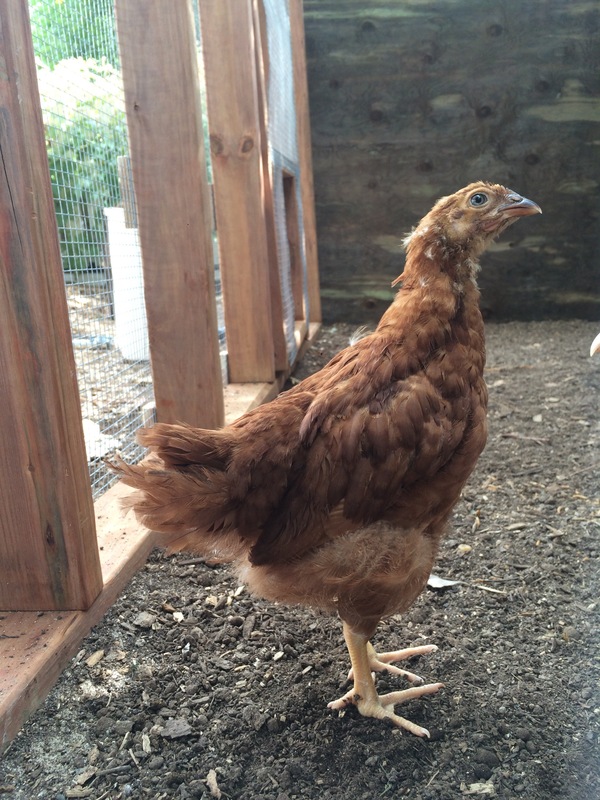 Having chickens is very trendy, so your fowl is on fleek. I know they are trendy. (That’s part of my chicken hesitation.) Am I just trying to be one of the cool kids?!? Bawk! Will continue to report on the chicken experiment. I have a dear friend who REALLY wants chickens, so I’ll be watching with interest! What an adventure! My in-laws have been into chickens for a while and a good friend started more recently. Chickens seem to be addicting 😉 Can’t wait to read more about your chicken experiences.